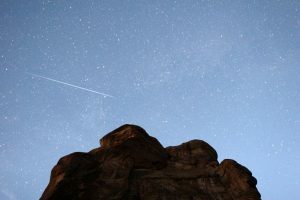 Watching for shooting stars is a fun way to spend the wee hours of the night. You spot a streak of light across the sky and maybe make a wish. Good times. For some people, saying those streaks of light are caused by the fiery disintegration of bits of comets as they zip through our atmosphere at high speeds kills the romance. For others, myself included, this just adds to the fun. The otherwise boring comet 209P/LINEAR is predicted to give us a brand new meteor show for North America in the evening hours of May 24. **EDIT: The actual shower will occur in the early morning hours of May 24. NOT the evening hours. See Meteor Storm Viewing Update for more details. This meteor show is also predicted to not just be a meteor shower, but a meteor storm. One prediction for this new meteor storm calls for a ZHR of 1,000 events per hour. ZHR, or zenithal hourly rate, is the measure of the number of meteor events per hour at the zenith under ideal night skies. A more recent prediction has the ZHR at a few hundred per hour. That’s still a pretty good show. This prediction also believes many of the particles from the comet will be larger than usual. This means meteors will burn longer and brighter. The meteors should be easy to see coming from the constellation Camelopardalis. Camelopardalis is a fairly dim constellation, so it may be easier to look slightly below and west of the North Star for meteors. Set your calendars for May 24. The moon will be close to the New Moon phase and should not overpower any night viewing. Start scouting for a dark place to watch the skies for what should be a great show. NASA’s Jet Propulsion Laboratory website has some good tips for viewing meteor showers. ← What Is a Jiffy?